You wouldn't normally find me smiling from ear to ear ahead of an 11 hour flight but after the vacation we had experienced in Hawaii, how could I not? A casual but cute airport look is always my go-to. You certainly won't find me in heels going through security but I just can't bring myself to don a pair of leggings and a hoodie either. This is my happy medium ensemble with fun basics like a jean jacket, casual denim and a large tote bag all while adding in fun elements like my favourite gold chain necklace, boater hat (this avoids them getting crumpled in your suitcase) and a printed, oversized bag. Not pictured is the large scarf or blanket I typically carry in my bag - I always tend to get super chilly on flights. Amazing, love this causal chic style! 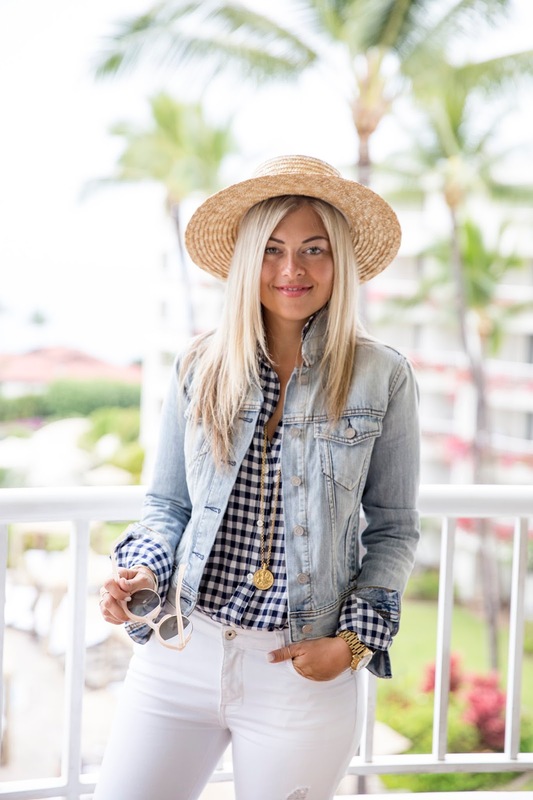 Love that gingham and denim jacket combo- a trusty pair that always looks so cute together! This outfit is wonderful, perfectly styled, travel day look! I love this outfit for the airport, it's super chic!